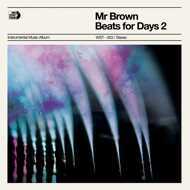 2010 saw the release of ‘Beats for Days’, Mr Brown's debut solo EP. A 10 track, instrumental affair featuring his production, scratches and artwork. Limited to only 200 copies, this vinyl release is now a sought after piece of his history and gives listeners an insight into an underground talent. A string of singles and collaborations followed (The Hubwish, 4our3ree, The Number Station and more) and in 2016 he has now readied Beats for Days 2. Armed with his SP1200, MPC and a the most vital ingredient....old records to sample! and once again releasing through his own imprint We Stay True, Mr Brown has delivered another 11 instrumental tracks of pure head nod bliss. So drop the needle, sit back and soak up the analogue garden that is Beats for Days 2.